There’s no better way to appreciate the beauty of Southern Idaho than to explore it on snowshoes or cross-country skis. You’ll experience the true quiet that comes from a blanket of glittering white powder and scenery formed by millions of years of wind, water, and — yes — snow. Bring your Nordic ski gear or snowshoes to Magic Mountain, and check out the cross-country ski trails directly adjacent to Magic Mountain Ski Resort. Magic Mountain is located about 35 miles south of Hansen in the South Hills. The High Desert Nordic Association grooms about 10 miles of the cross-country trails with equipment owned by Twin Falls County. The trails wind up the mountain from the ski area and take you up on top of the South Hills, providing for fetching views of the surrounding countryside. There is no trail fee, but donations to the association are appreciated. They also sell annual memberships. Cross-country skiers, snowshoers and backcountry skiers also might want to rent the Thompson Creek Hut in the South Hills. It’s a three-mile ski into the hut from the Magic Mountain area. The hut is a wall tent with a wooden floor. It sleeps six people comfortably. See more information about renting the hut and availability. The hut is also maintained by the High Desert Nordic Association. Want to ski across a volcano? You can do it at Craters of the Moon. (Don’t worry: It’s a dormant volcano.) Cross-country skiing and snowshoeing is available at Craters of the Moon through February. The seven-mile loop road is groomed, and there are no entry or user fees. Snowshoers will love the 1.5 mile snowshoe loop and other opportunities throughout the park. Stop at the Visitor Center (open daily except for federal holidays) for trail suggestions. With 22 miles of trails in the City of Rocks and another 12 miles in Castle Rocks, snowshoers and cross-country skiers can find deep quiet — and even see some of the area’s wildlife. You won’t find groomed trails, but you will find solitude and fantastic geological features. 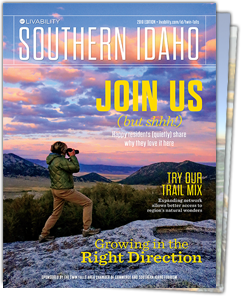 You’ll find all the information you need to get started right here at VisitSouthIdaho.com. Check out our Adventure Map for excellent trip ideas and discover great lodging options in our Stay section. Sign up for our free newsletter or download our Travel Guide to start planning your Authentic Adventure.